We’ve been so busy canning this past week! Alisha and I have canned tons of blueberries, blueberry jam, chokecherry jelly, bronco cherry jelly, and more Provider beans. I’ve had to totally rearrange some of our pantry shelves and am moving out onto the shelves Will told me “These are NOT for food.” when he built them. (So who listens, anyway? He hasn’t complained yet…) Saturday Will decided we had to try eating some of the Crawford beans we grew from seeds given to us. They are at least 9 inches long and nice and plump, light green with purple stripes. 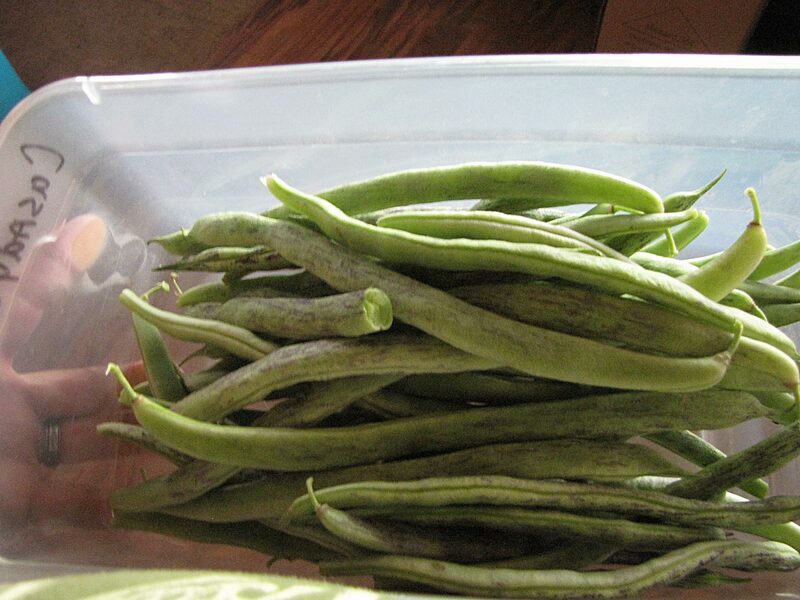 No, they’re not Rattlesnake beans, but a German pole bean generations old. So I “sacrificed” some beans and cooked them up to try. The total taste test by David, Ashley, Alisha, and myself was an enthusiastic thumbs up. I heard “Oh my God!” from two different eaters! They are really that good. I know I’ll never be without them in the garden, for sure. I’ve got to be sure to save lots and lots of seed for other gardeners to try. We are SO impressed with the Crawford beans! On Sunday, my oldest son Bill and his family came up, so work halted while we visited. We toured the gardens, petted various animals, and the kids tried some carrots they pulled from the main garden. They got a real kick out of learning some sign language too. Luckily, Bill still retained some from when he was living with his deaf brothers and sister from Korea, years and years ago. Soon, Mason was signing like a pro and Ava was spelling her name with no prompting. Mason said he wanted to stay for a week so he could learn more sign! (But he couldn’t because he had Science camp this coming week.) 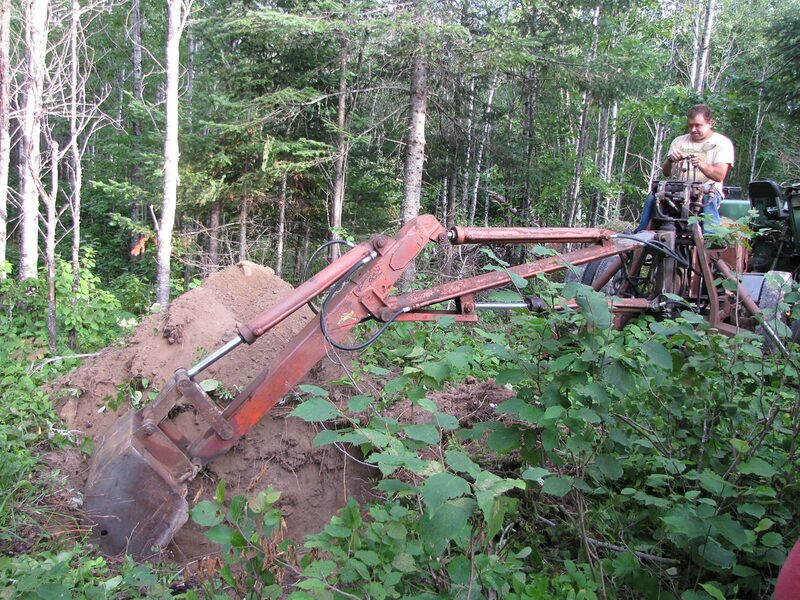 After the family left, Will hooked onto our old backhoe and drove it over to David’s cabin. They needed an outhouse hole as we’d gotten a permit and the hole needed inspection before the building was put over it. It must be 3’x3’x3′ in size. (Pretty big outhouse hole, I think!) Will figured David should learn to use the backhoe so David jumped up onto the seat and took some quick operation lessons before he started digging. (He almost took out his storage shed before figuring out how delicate a touch was needed on the levers!) Soon he was operating like a pro. And the hole got deeper and deeper. Luckily, the ground there is sand and rock so we know it’ll pass inspection easily. Finally, Will jumped down into the hole and gave David a thumbs up. 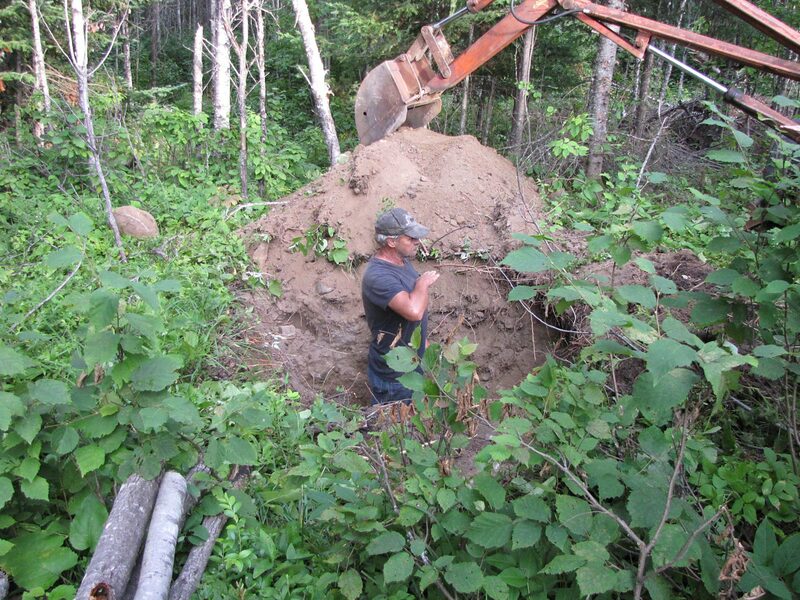 David got to learn to use our old backhoe to dig his outhouse hole. Will advised David to build a cedar slat box with 2×6 lumber to prevent the sand from caving in later on. Then the hole will be backfilled around the box so the privy can be built over it. With that deep a hole, it will be good forever! When they can afford it, they plan on putting in a septic system too. Will gives his approval of the hole’s size. Our dry weather is holding so Will is out on the hay field with the square baler. He and Alisha will be loading our small trailer with about 20 bales then going back for more later on as there isn’t any rain in the forecast. We plan on baling about 150 bales to use as mulch next year. No running water in the house as it isn’t allowed until there’s a septic system. The running will be done by David, hauling water for awhile. Why do you need a permit for an outhouse? I’m a bit confused with the measurements of the outhouse. How deep is it? Thanks! Are the Crawford beans bush or runner? Also, how stringy? The Crawford beans are definitely a runner or pole bean, reaching 10′ or so. Picked fairly young, not stringy at all, but when they get fatter and older, they do have strings like many old timey beans do. I don’t know about a three foot deep hole lasting forever. The last time we moved the outhouse we dug 3′ wide and 6′ long and put down treated planks to set the 4′ x 4′ outhouse on with a plywood And pallet cover on the other half so we will just have to slide it over to move it. Last winter the pile under the seat got way too high because one of our daughters spent the winter and she wouldn’t use a “night bucket” so between lots of paper and liquid freezing it built up and froze hard enough that it couldn’t be shifted to the side even with the iron bar. I’m sure you have lots of experience with such things. We picked provider beans yesterday. By the way our patent from the state ( deed) give us permission for a “pit privy” but requires that we have an engineered system if we want to put in a septic system. Around here that would probably require an above ground leach field. Well, so much for the three foot deep hole; the inspector called and said she needed to see an eight foot deep hole! So now there’s an eight foot deep hole. Holy mike! Yep I know what you mean. In our past outhouses, NO toilet paper went in the pit. We kept a bag for it in a bucket in front of the bench. I’ve learned from past experience, much of what gathers beneath the seat is toilet paper and if you eliminate that, the pit takes much longer to need redigging. Yep, we needed an “engineered” septic system too, which is why David is going with the privy for now till he can afford a septic system. Luckily, he’s on a gravel hill. Were they Red Wing Blackbirds? We have them here in WV and they always nest on the ground. Yes, but here, they usually nest down in the swamp on cattail islands. Only 3′ deep? That doesn’t seem like much. I didn’t realize you would need a permit for a pit toilet, though around here I don’t think they are allowed at all anymore. Septic systems can be expensive, this is a good way to give them time to save up for it. Will they have running water in the house sooner? A dry well system for grey water is much cheaper to put in, and with your sand and gravel so handy they can probably accomplish that without too much waiting.